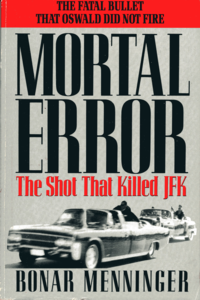 Mortal Error: The Shot That Killed JFK is a 1992 non-fiction book by Bonar Menninger outlining a theory by sharpshooter, gunsmith, and ballistics expert Howard Donahue that a Secret Service agent accidentally fired the shot that actually killed President John F. Kennedy. Mortal Error was published by St Martin's Press in hardback, paperback, and audiobook. Menninger is also the author of And Hell Followed With It: Life and Death in a Kansas Tornado, which won a Kansas Notable Book Award in 2011. Photo showing driver Agent George Hickey shortly after JFK was killed holding the AR-15 rifle that accidental shooting theorists say killed Kennedy. Donahue first became interested in the story of the assassination of John F. Kennedy after participating in a re-creation of the shooting as one of eleven invited marksmen and sharpshooters. He demonstrated that it would have been possible for Lee Harvey Oswald to have fired three shots in the time specified by the Warren Commission, and was the only one of the eleven to better the 5.6-second window. However the experience highlighted to Donahue other concerns regarding the Warren report, and in particular the fact that the testimony of ballistics experts seemed to have been completely omitted from the Commission's evidence gathering. Conducting his own investigation, Donahue eventually decided that the bullet that struck Kennedy in the head had in fact been fired by United States Secret Service Special Agent George Warren Hickey Jr. (March 24, 1923 to February 25, 2005) from an AR-15 rifle carried in the car immediately following the President's vehicle. The series of events is as follows: After the first shot which hit the street was fired, Hickey turns completely around and acquires Oswald on the sixth floor of the school book depository building. His turned head is documented in an AP photograph by James Altgens. Hickey reaches for the AR-15 under the seat, releases the safety and begins to lift the gun. The second shot is fired by Oswald, hitting the president and Texas Governor John Connally. The president's car and the follow-up car containing Hickey suddenly speed up. This is attested to by Secret Service agent Clint Hill. Agent Hickey, who is unstable because he is standing on the cushion of the seat, rather than the floor of the car, begins to fall back due to the acceleration of the vehicle, pulling the trigger of the AR-15. The gun is pointed toward Kennedy at that instant, and the bullet strikes him squarely in the back of the head. In parallel, he believes Oswald's second shot through Kennedy's neck may have already critically wounded the president before the third shot was fired. Donahue was encouraged in his investigations by Ralph Reppert, a reporter for the Baltimore Sun. In 1977, Reppert published Donahue's theory in two articles, which appeared on Sunday, May 1, and the following Sunday, with the second article accompanied by an editorial. These two men were keen to collaborate on a book on the subject, but this was cut short by Reppert's ill health and subsequent death. Donahue later also approached author John Davis in the hope that a book would still be written. The original copyright of Mortal Error read "Copyright 1992 Bonar Menninger and Howard Donahue" but some later editions did not mention Donahue's copyright. The Acknowledgements section (dated January 21, 1992) begins "Special thanks to Nick Beltrante for a great news tip, the late Ralph Reppert for showing the way, Howard and Katie Donahue for casting their lot with me ...". Donahue's reconstruction of the trajectories of the shots that struck Kennedy and Governor Connally supported the single-bullet theory for the second shot. Donahue decided that the impossible trajectory suggested by the Warren Commission was only necessary because there was an error in their positioning of Connally. He also concluded that this was Oswald's second shot, the first having missed owing to the misalignment of the rifle's telescopic sight but with a ricochet fragment slightly wounding Kennedy, and that Oswald had not fired a third shot, the third cartridge case found at the scene having been a slightly bent and empty one kept in the rifle's chamber. Neither Donahue nor Menninger commented on whether the Warren Commission's key finding, that Oswald acted alone, was correct or not. Menninger notes that the theory is consistent with Oswald being involved in a conspiracy. The term "cover-up" is mentioned in the book, rather than conspiracy. The book takes the overall form of a narrative, in which Menninger describes Donahue's enquiries over twenty-five years. Chapter 1, A Chance Telephone Call, describes the events that led to Donahue's interest in the assassination, and a brief biography up until that point. Chapters 2 and 3, The Warren Report and The Critics, then give the context and summary of the report, and a detailed summary of its critics as of 1968. Chapter 4, The Single Bullet Theory presents Donahue's analysis of the shot which, according to the Warren Commission, struck both Kennedy and Connally, and suggests that the "magic bullet" trajectory is only necessary because the estimated position of the Governor was wrong. One of Oswald's shots could therefore have caused both men's injuries as claimed, but there remain other unanswered questions. Chapter 5, The Head Shot describes Donahue's analysis of the shot that hit Kennedy in the head, using the Warren Commission evidence (particularly the official autopsy report), stills from the Zapruder film and other photos, and holes drilled in a plaster skull. Numerous questions arise surrounding the completeness and even accuracy of the autopsy report. Chapter 6, A Fortuitous Encounter, describes Donahue's first correspondence with the Secret Service, and reviews the conclusions that led to his approaching them. He then by chance meets Dr. Russell Fisher, who led the Clark Panel which reviewed the autopsy in 1968, and who provides a copy of its report and many insights into details of the autopsy report and problems with the material provided to the panel. The suspicion of an accidental discharge by a Secret Service agent grows. Chapter 7, Kennedy's Unknown Wound, describes Donahue's conclusion that Kennedy suffered a scalp wound from a ricochet fragment from Oswald's first shot, using the material provided by Fisher. This resolves some problems with the timing of the reactions of Kennedy and Connally. Chapter 8, Murphy's Law, resumes the story of Donahue's career as his expertise and reputation as an expert witness grows. Chapter 9, The Discovery, describes more of Donahue's career, and his discovery of a photo showing a Secret Service agent holding a weapon that could have produced the kind of wound Kennedy suffered (the photo eventually used on the cover of the book). This revives his interest in publishing an article on his findings. Chapter 10, Breaking News, describes the first publication of Donahue's conclusions in articles by Ralph Reppert, and attempts to contact Hickey. Questions are asked regarding the nature of the cover-up, and particularly about whether Robert Kennedy was involved in it. Chapters 11 to 13 describe Donahue's experiences with the United States House Select Committee on Assassinations. Chapter 14, The AR-15, describes the ill health and death of Reppert, the reporter who wrote the articles that broke the story, which ends their proposed collaboration on a book on Donahue's theory and puts the book proposal on hold. The story of the AR-15 is told, with comparisons to the M-1, AK-47, M-14, and M-16, and some very critical assessments of the adoption of the M-14 and M-16. Chapter 15, The Final Breakthrough, presents more ballistics, especially estimating the size of the head shot entry wound and its relevance. John Davis, another possible author for the book, is contacted and is at first enthusiastic. Howard gives up his Masters studies in forensics but becomes increasingly employed as an expert witness despite this. Chapter 16, Hope Dies Hard, gives a brief history of the Secret Service, their nightmare assignment guarding Kennedy, and their reaction to the shooting. There follows Hickey's involvement in the Warren Commission and statements by him and other agents. Donahue's conversation with one notable conspiracy theorist is also described. Chapter 17, Today, is a recap as of spring 1991, describing reactions from Secret Service agents and others to the theory, and more attempts to contact Hickey. An afterword headed Note from the Publisher describes more attempts to contact Hickey, and to discuss the theory with the Secret Service and others, and why the decision to publish the book was taken. Finally, there are chapter by chapter endnotes giving sources and their bibliographic details, and an index. Reaction to Mortal Error has been mixed. James Balducki of the Associated Press cited that Donahue's "scrupulousness" made his theory of the JFK assassination plausible. Balducki praised the book, saying "Menninger interprets the story with a sharpness and fluidity that never unravels amid the surge of detail". David Pietrusza called Donahue's theory unusual due to him not tying the assassination to Mafia, CIA, or FBI, but that there were "still problems with Donahue's theory". The Hamilton Spectator criticized Mortal Error as "missing the mark". Pre-publication orders topped 100,000, but the book caused little impact at the time. Menninger commented in 2013 that it might be because Donahue's theory was "equally disliked by both conspiracy theorists and supporters of the Warren Commission." Howard Donahue died in 1999. In The Smoking Gun documentary, his daughter Colleen Donahue Lorenzen remembers her father being surprised that his work aroused so little interest. At the time of his death, Donahue was working on another book on the same topic. In 2013, Australian journalist and former police detective Colin McLaren published a book and documentary both titled JFK: The Smoking Gun, examining and supporting Donahue's theory. Prior to the publication of the book in 1992, both the publisher and the author contacted Hickey to invite his participation in the book and offering him a chance to respond to the allegations. In 1995 Hickey sued St. Martin's Press over the claims made in Mortal Error. The suit was eventually dismissed in 1997 on the grounds that Hickey had waited too long after the book's initial publication to file against the publisher. Hickey refiled suit when the paper-back edition was published, and later settled with St Martin's Press in 1998 on undisclosed terms. Sources state that Hickey died in either 2005 or 2011. ^ a b "Mortal error? Agent's accidental shot killed JFK, book asserts". Fort Worth Star-Telegram. February 23, 1992. Retrieved August 5, 2012. ^ a b Hunter, Stephen (February 23, 1992). "Author says friendly fire killed JFK". Baltimore Sun. Retrieved August 5, 2012. ^ Burnes, Brian (February 21, 1992). "Another JFK theory: An accident Kansas City man's book says fatal bullet was fired by a Secret Service agent". Kansas City Star. Retrieved August 5, 2012. ^ "Agent's Error Killed Kennedy, Book Says". St. Louis Post-Dispatch. February 23, 1992. Retrieved August 5, 2012. ^ p. 146 Of course, Donahue's understanding of the fatal shot in no way precluded the possibility that Oswald was involved in some kind of conspiracy. ^ Bready, James (February 27, 1992). "The 'JFK' theory that's too simple for Americans to believe". Baltimore Sun. Retrieved August 5, 2012. ^ a b Balducki, James (June 7, 1992). "New JFK assassination book just another theory". Observer-Reporter. Retrieved August 5, 2012. ^ Pietrusza, David (1996). Mysterious Deaths — John F. Kennedy. Lucent Books. pp. 71–72. ISBN 1560062630. ^ Legall, Mark (March 28, 1992). "'Fumbling agent shot JFK' theory misses the mark". Hamilton Spectator. Retrieved August 5, 2012. ^ "TAKE 5: Author: Accidental shot killed JFK". Sanford Herald. November 15, 2013. Retrieved December 2, 2013. [the theory was] equally disliked by both conspiracy theorists and supporters of the Warren Commission. ^ Gay, Verne (October 31, 2013). "'JFK, The Smoking Gun' review: Conspiracy theory documentary feels recycled". Newsday. Retrieved November 30, 2013. ^ Rasmussen, Frederick N. (December 21, 1999). "Howard C. H. Donahue, 77, ballistics expert, studied Kennedy's death". Baltimore Sun. Retrieved November 30, 2013. ^ http://articles.baltimoresun.com/1999-12-21/news/9912210051_1_donahue-ballistics-expert-warren-commission retrieved 16 December 2013 According to his daughter, Colleen Donahue Lorenzen of Riderwood, Mr. Donahue was working on a related book at his death. "He had discovered a TV tape in a German archive that showed the assassination from a different angle as well as a Secret Service agent standing up in a car." ^ "Suit Filed over JFK Book". The News. August 23, 1996. Retrieved August 5, 2012. ^ "JFK killing theory on trial for libel". Lawrence Journal-World. August 23, 1996. Retrieved 5 August 2012. ^ O'Brien, Dennis (September 30, 1997). "Defamation suit involving book on JFK dismissed Judge notes time limit". Baltimore Sun. Retrieved August 5, 2012. ^ "Retired agent paid undisclosed amount in JFK shooting case". Gettysburg Times. February 4, 1998. Retrieved August 5, 2012. ^ Bark, Ed (October 29, 2013). "Look out, it's only just begun: ReelzChannel weighs in early with JFK: The Smoking Gun". unclebarky.com. Retrieved June 18, 2014. Hickey, who died in 2005, refused to talk to Menninger or Donahue for the purposes of their book. ^ "TAKE 5: Author: Accidental shot killed JFK". Sanford Herald. Sanford, North Carolina. November 15, 2013. Retrieved June 18, 2014. George Hickey died in 2005, but not before taking legal action in response to "Mortal Error." ^ Rule, Andrew (October 25, 2013). "Aussie out to show Secret Service blunder was to blame". Herald Sun. Melbourne. Retrieved June 18, 2014. Hickey died in 2011, which makes it easier to tell the story without the fear of a lawsuit. ^ Doyle, John (November 4, 2013). "Did a hungover Secret Service agent accidentally shoot JFK?". The Globe and Mail. Toronto, Ontario. Retrieved June 18, 2014. Hickey died two years ago [i.e. 2011] and isn't around to answer the charge. ^ Arkin, Daniel (November 21, 2013). "Accidental assassin: JFK theory alleges Secret Service agent fumbled gun". NBC News. Retrieved June 18, 2014. Hickey, who died in 2011, filed a libel suit against Menninger, Donahue and St. Martin's Press, the publisher of Menninger's book, in 1995. Hickey v. St. Martin's Press, et al., United States District Court, D. Maryland. 978 F.Supp. 230 (1997), September 29, 1997.